This script places a new sub-menu in the menus when you right click on song(s) in the 4 pop-up menus (Main Window, Track List, Now Playing & Menu_Pop_Tree) as well as a menu item in the Search toolbar. It reads through an ini file and loads the menus with urls for various web sites. There's also the ability with the dockable panel or separate MM window to do tagging. Choose one of these windows, select text in the browser, then click the appropriate button to copy the text to the tag (see screenshot below). 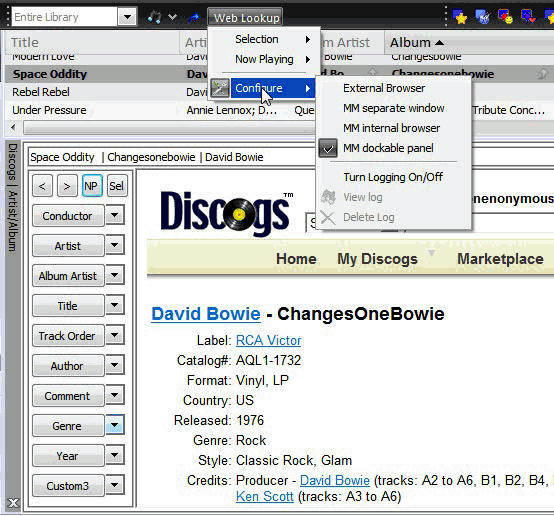 To use, right click on a song and find the new "Web Lookup..." menus. Select one of the items from there. This script was inspired from the excellent WebNodes script as well as WebPanels. I borrowed the URL parsing code from those scripts (thanks Trix!) as well as the LogMe code which is credited to psyXonova. - Fixed the bug (I think) in 1.53: "A component named RCFW_WebForm already exists." - Added "Recent Webs" drop down to the Panel & Form. Each time you select a new web lookup from one of the right-click menus or the new drop down, that selection becomes item 1 in the drop down and all the other items move down a step. It keeps the 5 last webs handy for you. Now you can select the web you want from here to get to it quicker. I could expand the count from 5 if needed - so please give me feedback on this feature. - Fixed bug that sometimes tagged the wrong text This occurred sometimes if you had opened the Dockable Panel or Form, tagged something, then changed the web page you were viewing in the Panel or Form, then tried to tag something. Download the full installer for v 1.3 **Includes the RightClickForWeb.ini file** If you've customized your RightClickForWeb.ini file, please back it up before installing the new version as the installer will replace it with a new version. -Fixed code in the section to show the web page in MM internal browser, where it sometimes didn't update the internal browser page correctly. -Added ability to set where to launch the browser - default is to an external window like in previous version, but you can also set it to launch in a MM window or the MM built-in browser. See the instructions in the code below for setting your preference. I could give you a choice at run-time rather than set your preference, but then it starts getting lots of menus and I think would be confusing. If anyone has UI suggestions, please let me know! -Added many more websites to the ini file. The more entries you keep in your ini file, the longer it takes to open MM. Mine opens quickly, but I've got a fast computer. If yours takes too long, you might want to remove some of the entries. -top right button to turn on/off the auto-update for the Now Playing song. (not showing in screenshot - but it's there...) When checked, the panel automatically updates to the new song. -Next 10 button/drop down combos. Select the drop down arrow to choose a different item to tag. Select some text in the browser window, then click the button to copy the selected text to that tag. Last edited by onenonymous on Sun Jul 27, 2008 3:50 pm, edited 20 times in total. This is awesome! I love the idea and I love how the script works! It's great to have this functionality for all the songs and not being restricted to the song I'm listening to. Thanks for a great script! And thanks for all the nice links you've already added! This is a nice one, now the features of webnodes with an added convenience. Gonna have to play with this one, Good job!! Brilliant!! Really like this one!! Thanks a lot!! Super! Right clicking is fun! Glad you all like it. I'm working on an update that gives the same functionality, but rather than the selected file, it will pull up the web for the currently playing song - sort of the same as WebNodes does, but via a right click. I'm busy this week, so don't look for anything till the weekend. Also - if anyone has other websites that you've found, please post the code for them. I'll add your sites to my listing in the first post for everyone to benefit. Last edited by onenonymous on Tue Mar 04, 2008 6:12 pm, edited 1 time in total. Nice script ,i installed it so i can right click instead of having to play the song , as with "WebSearch Panels" ;but , can it be made so an embedded "WebSearch Panels" opens instead of a browser ? Great job!.....Just what the doc ordered! Thanks for the effort and looking forward to the enhancements. linn wrote: Nice script ,i installed it so i can right click instead of having to play the song , as with "WebSearch Panels" ;but , can it be made so an embedded "WebSearch Panels" opens instead of a browser ? Now I am the opposite, I prefer to have it open in a browser. I suppose it's possible. I'll have to figure out how to implement panels though - still learning MM scripting, haven't gotten to those yet. this is awesome man, i hated always looking up info in the built in browser (IE) and now i can just search with Firefox!! thanks a lot man, really nice!!!!!!!!! Yes, this is fast becoming my most used script after Right Click for Scripts, of course. Gotta right click. Question: How would I go about tweaking the Amazon menu item to only go to .co.uk addresses? I live in Denmark and use Amazon.co.uk almost exclusively. I would love to be able to go there from MM. spacefish wrote: Yes, this is fast becoming my most used script after Right Click for Scripts, of course. Gotta right click. spacefish wrote: Question: How would I go about tweaking the Amazon menu item to only go to .co.uk addresses? I live in Denmark and use Amazon.co.uk almost exclusively. I would love to be able to go there from MM. In general, go to the URL of the site you're looking for, and see how it's constructed. Replace any instance of the artist name with %artist, replace the album name with %album% etc. In some case, we use Google to find the page so you may try to mimic the entries that I have above that use google just replacing the "site:amazon.co.uk" piece with the actual site. This may not always work, but it often does for me. Last edited by onenonymous on Wed Mar 05, 2008 10:54 pm, edited 1 time in total.